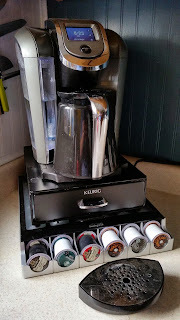 One of the largest complaints I had in my review of the Keurig 2.0 K550 Brewer was the fact that I had to give away a lot of coffee because it wouldn't work in the new brewer. As I had stated in my review Keurig tried to hide the fact that you had to use official K-Cups in the 2.0 brewer by making a big deal about the brewer being able to scan the cups you put in to automatically brew the perfect cup. Not only doesn't this actually work at all (please see the Review for more information) but only amounts to trying to control the market for K-Cups by ensuring the brewers will only brew K-Cups from companies that have licensed the technology from them.